ASTM SCH40 Standard include ASTM PVC, SCH40 PVC, SCH40 Pipe, SCH40 PVC Pipe etc. Find ASTM PVC, SCH40 PVC, SCH40 Pipe on Industry Directory, Reliable Manufacturer/Supplier/Factory from China. Product categories of ASTM SCH40 Standard, we are specialized manufacturers from China, ASTM PVC, SCH40 PVC suppliers/factory, wholesale high-quality products of SCH40 Pipe R & D and manufacturing, we have the perfect after-sales service and technical support. Look forward to your cooperation! JESSRO PVC pipe and PVC fittings of ASTM schedule 40 standard are make from super PVC materials. This kind of materials can be used for cold water under high pressure for long time. So our PVC pipe and PVC fittings are widely used in construction, water treatment ,swimming poor and water project in pisciculture . 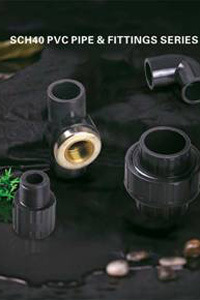 PVC Pipe is also suitable for PVC plastic drain, waste, and vent (DWV) applications. Generally resistant to most acids, bases, salts, aliphatic solutions, oxidants, and halogens. Chemical resistance data is available and should be referenced for proper material selection. Pipe exhibits excellent physical properties and flammability characteristics (independently tested flame and smoke characteristics-ULC). Typical applications include: chemical processing, plating, high purity applications, potable water systems, water and wastewater treatment, drainage, irrigation, agricultural, and other applications involving corrosive fluid transfer. We have all the size from 1/2" to 4" in a full range items. And we can supply different color as white, dark grey, light grey and blue. All of our PVC pipe and PVC fittings of ASTM SCH40 Standard can following your specific requirement .And we can supply you the professional service.